Project Title : ''Childhood obesity in India - a multi-center study on its measurements and determinants"
North Eastern Indira Gandhi Regional Institute of Health & Medical Sciences (NEIGRIHMS) is an Autonomous Institute established by Government of India in 1987 under the Meghalaya Registration of Societies Act 1983. The then Prime Minister Late Rajiv Gandhi dedicated the Institute to the memory of Late Indira Gandhi, former Prime Minister for her commitment to the welfare and affection for the people of North Eastern Region. It has now been designed as a Postgraduate Medical Institute in the lineage of AIIMS, New Delhi and PGIMER, Chandigarh. 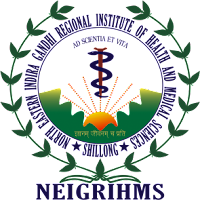 NEIGRIHMS has been the First and the only Postgraduate Medical Institute in the North Eastern Region and third in the country established by Ministry of Health and Family Welfare, Government of India.